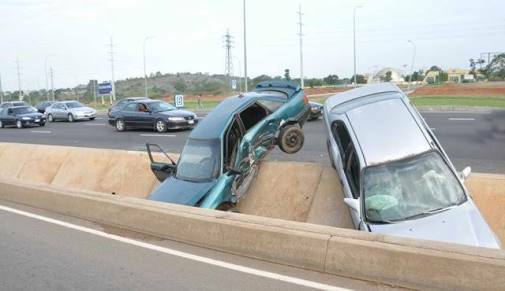 The story has been told of the Abuja airport road where too many deadly crashes have sent many people to their early graves. Sometime in May 2015, six staff of Radio Nigeria had a brush with death on the Musa Yar’Adua Expressway, popularly called Airport Road, Abuja. The car conveying them home, after a stressful production hours, had rammed into another vehicle while the driver was receiving a telephone call. According to the most senior among the staff, Eugene Ngwu, the incident resulted in a multiple accident. He told Daily Sun that all of them were lucky to survive. They, however, sustained various degrees of injuries after they were rescued from the gutter. The journalists were lucky to be alive to recount their ordeals but many others were not. Many who had accidents on the road were not lucky to tell their stories. On daily basis, crashes on the Airport Road, which have become a common and regular occurrence, have assumed alarming dimension. Morning, afternoon and night, the situation remained the same -deaths, crashes. Different kinds of vehicles had been seen buried inside the shallow gutters. They sometimes turned upside down, while trapped human beings cried for assistance. Many that defiled the repeated caution and measures to use the pedestrian bridge have contributed to the increase as they become victims of hit and run motorists while carelessly crossing the major roads. Crash incidents have been on the increase, not even the visible presence and the stationary or patrolling operational vehicles belonging to the Federal Road Safety Corps (FRSC) could stem the tide on the Airport Road. Although the FRSC FCT Command could not easily lay its hands on the casualty statistics, the major and minor crashes on the Airport Road has made the smoothly tarred road a highway to hell. Blame the crash incidents on human factors like over speeding, fatigue, impatience and overloading, you would not be far from the reality. Blame it on environmental or mechanical factors like faulty vehicles, burst tyres and insensitivity this is also correct. However, the road crashes are not the only contributory factors that made the Airport Road a highway to hell. There are also constant robbery attacks on motorists and other road users. Woe-be-tides any motorist whose vehicle brakes down on the road especially at the late hours of the night. He will certainly be at the mercies of the merciless and heartless armed robbers. If he escapes with his life, his vehicle will be at the mercy of the yet to be identified tyre thieves who usually removes the tyres and support the vehicle with big stones. Police authorities had claimed that they had recently deployed adequate measures to checkmate the spate of the robbery attacks, but the perpetrators would proactively devised other means. The incessant robbery attacks on top of pedestrian bridges are not also helping matters. Those that do not want to risk crossing the ever-busy road were left at the mercies of the robbers operating freely on top of the bridges. Airport Road has put sorrows, pains and sad memories in the hearts of many families. It is a bloodsoaking highway that has sent many souls into untimely deaths. For Mustafa Ibrahim, a motorist, factors responsible for the high casualty figure on the road are not unconnected with human factors especially carelessness: “Government officials that have no value for other road users and by extension human lives constitute the greater cause if the crashes on Airport Road. They take their recklessness to the zenith on that road. Corroborating Mustafa’s perception, the Sector Commander, FRSC FCT Command, AG Wobin, told Daily Sun: “Crashes along the Airport Road are not far from the major three factors responsible for road crash. They include the human factor, mechanical factor and of course the environmental factor. “On environmental factor, the Airport Road is very good that people hardly see a single porthole from the City Gate to the Airport. So, there is always the urge and temptation to speed. Over speeding is a serious concern along that road. “Rainfall is another form of environmental perspective on that road. We discovered that once there is rain, drizzling not even a downpour, the rate of crashes increases. We will see people entering the water channels, those gutters separating the service lane from the main express road. “It is not unlikely that many of these motorists may have poor vision. For others, their wipers may not be functioning. We also noticed that many people that have poor maintenance culture that usually ply that road were equally tempted to speed like others. “How many people do morning parade on their cars before putting them on that road? On several instances, tyres of vehicles had pulled out, resulting in the vehicles somersaulting into the gutters or centre of the road. “Among all these, human error constitutes over 80 percent of the crashes along that road. Most lockdowns experienced on along that road were associated with over speeding. The situation had become so alarming before the Minister of FCT deployed taskforce to monitor the usage of the pedestrian bridges. It really yielded results because most of the lockdowns have reduced drastically. “Again, it baffles me how some people will wait till few minutes to their flight time before leaving to the airport. Attitude is an issue in this case because the jaw-breaking speed they always move is usually terrifying. “It is peculiar among those that have fast-moving vehicles that can cover a distance of 50 kilometres in 10-15 minutes. They usually don’t have any regards for the other road users in their reckless driving. “Another major cause of the crashes along that road is the issue of fatigue and sleeping off while driving. On several instances, motorists that didn’t have enough sleep usually enter the road. If you must drive yourself, make sure you have enough rest. “Since most vehicles are now automatic gear system, there is bound to be fatigue because only one leg is performing all the functions while the other is redundant. Without proper circulation of blood, there is bound to be fatigue and dosing off on wheel. Although the FRSC evolved several measures to reduce or eliminate the crash rates, there must be concerted resolve by motorists to resist certain causative factors like over speeding, just as drivers in charge of government convoys must be reoriented. Enumerating the measures by the authorities of the FRSC, Wobin said: “We have placed many operational vehicles and ambulances at strategic positions along that road for prompt response to emerges. The teams in charge of the operational vehicles have the responsibility of condoning off crash scenes, attending to the injured before the arrival of our zebras or ambulances. Although he could not confirm the frequency of the robbery attacks on the innocent motorists and pedestrian users, spokesperson for the FCT Police Command, Mr. James Ajugiri, said: “Instead of speaking specifically on the Airport Road, I would rather want to comment on the general security situation in the FCT. I want to let the public know that we have made several deployments of patrol vehicles along the Airport Road to beef up security.